LEIGH NOTLEY PHOTO | Carl Alexander and Kirk Satterfield, winners of the Metropolitan Pro-Pro Team Championship co-hosted by Gardiner’s Bay Country Club. The Metropolitan Pro-Pro Team Championship, played over the links of co-hosts Gardiner’s Bay Country Club and The Bridge, on October 3 and 4, was won by Carl Alexander and Kirk Satterfield of The Golf Club of Purchase. In a better ball of a team-of-two format, Alexander and Satterfield shot 128, 14 under par. They triumphed by three shots over the teams of Tyler Jaramillo (Seawane Golf Club) and Heath Wassem (Fenway Country Club); and Michael Laudien (Rotella Memorial Golf Club) and Dave Fusco (Patriot Hills Golf Club), who both shot 131. 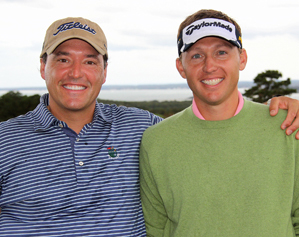 Alexander and Satterfield began the championship at Gardiner’s Bay with a sensational 60, 10 under par. Satterfield, assistant to golf pro Alexander at The Golf Club of Purchase, has been in fantastic form. He recently won the MET PGA Assistants Tour Championship with a sparkling 63 at Rockaway Hunt Club. He stated after last Monday’s round that the Gardiner’s Bay greens were the purest putting surfaces he’d played on all year. That opinion was reiterated throughout the field. Pro after pro left the 18th green commenting on the exceptional quality of the greens and what a delight and hidden gem they had discovered in Gardiner’s Bay Country Club on Shelter Island. Many of the younger professionals had never been to GBCC and they were wowed with their experience. Golf clubs represented in the field of competitors included the likes of Shinnecock Hills, Friar’s Head, Century, The Creek Club, Quaker Ridge and Deepdale. The quality of the field wasn’t in question. More than 35 of the top 50 professionals in the Metropolitan Section battled through the two rounds. The MET PGA decided to create a ying/yang set-up. The Bridge was set up beastly: there were only four scores in the 60s on Monday. Meanwhile, Gardiner’s Bay, the beauty, was set up as a birdie fest. Generous hole locations and immaculate greens led to the field posting a combined 109 under par on Monday — a birdie blitz. Chance Scheffing and I shot 144 for the 36 holes, a respectable finish that put us in a tie with Bob DeStefano, who teamed up with Dave Gosiewski from Noyac Golf Club. Well played, Bob! We thoroughly enjoyed hosting the event. Receiving so many unsolicited compliments left, right and center concerning the quality and presentation of the golf course left us all with an incredible feeling of fulfillment and gratification that we belong and we’re heading in the right direction. What a tremendous finish to a great golfing year at Gardiner’s Bay Country Club. The Sessa family continued to positively represent GBCC and topped off a fine year of golf. Samantha Sessa, who is now our youngest-ever club champion, did the double: along with her ladies title here, she won her junior championship at Cherry Valley Country Club in Garden City. Slammin’ Sammy made three birdies and an unfortunate triple bogey but shot a sensational level par 72. Not bad for a newly turned 15 year old! LEIGH NOTLEY PHOTOS | Jay Sessa recently played United States Senior Amateur Championship at Kinloch Golf Club in Virginia. Sam’s father Jay, 14-time Gardiner’s Bay club champion, recently qualified for the United States Senior Amateur Championship. He was leading qualifier last month at Elmwood Country Club in White Plains, no mean feat in itself. The championship was held at Kinloch Golf Club in Virginia. Kinloch is a sensational golf course. It’s currently ranked at 48th in Golf Digest’s top 100 courses in America and has been as lofty as 29th, back in 2008. The format of the championship was 36 holes of stroke-play and then the top 64 moved onto matchplay, a head-to-head knockout. Jay shot very solid rounds of 73, 76 to qualify for the matchplay section and take the 36th seed, a great achievement. Unfortunately, Jay lost his first round match against Kent Frandsen from Indiana. Frandsen, a member of Pine Valley, the world’s number-one golf course, threw four birdies at Jay on the first eight holes, including an 80-foot birdie putt on the par-4 second and a holed 30-yard pitch shot on the par-3 seventh. Jay fought well and was only 2 down at the turn. Jay birdied the 17th to go 1 down but they tied the 18th. It was a tremendous performance by Mr. Sessa to get into the tournament itself but making the matchplay stages was fantastic. Club ladies champion Samantha Sessa won her junior championship at Cherry Valley Country Club in Garden City last week. Congratulations and well played, Jay. An added bonus is that Jay, through his performance, qualifies for the 2012 British Senior Amateur Championship next year at Machynys Peninsula in Southern Wales. We look forward to following your trans-Atlantic trip, Jay. Back at Gardiner’s Bay Country Club, we held our last member tournament of the year, the Mixed Twosomes Team Championship, aka “The Divorce Open!” Several of the ladies finished the round bemoaning their husbands’ inability to putt well! But our intrepid group of competitors took on cool temps and stiff blustery winds. The result was impressive. Marc and Melina Wein shot a net 72 to finish 3rd. Kevin and Sue Scanlon, also 72, pipped the Weins by a shot in a card playoff to finish 2nd. 1st net went to Jim and Judy Bennett, who shot a level par 70 to win. Congratulations to the net winners. 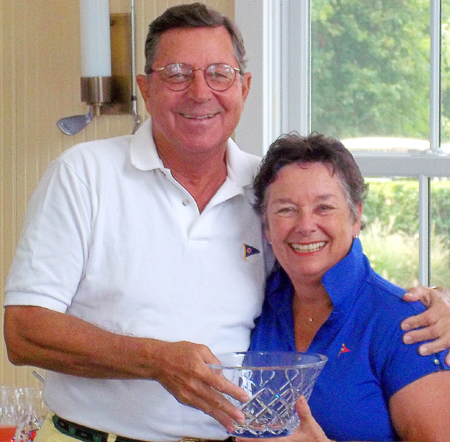 Net winners of the Mixed Twosomes Team Championship, Jim and Judy Bennett, shot a level par 70. However, the biggest round of applause went to Roy and Patti Bumsted, who annihilated the field. They shot 83 to win the gross division by six strokes; their net was 64. It was a remarkable round on a rough day. Although the writing was on the wall, Roy Bumsted had warmed up well for the championship: a couple of days earlier, he had knocked a 7 iron into the hole on the 18th for an eagle two. Thank you to all our members and their guests who participated in all our tournaments in my first season as head golf professional of Gardiner’s Bay Country Club. I feel very honored to hold this position at a wonderful country club in a sensational setting. I continue to fall further and further in love with this Island. We are all privileged to be spending time here! Thanks again and see you all next spring for more tournaments. COURTESY LEIGH NOTLEY | The Ladies Closing Luncheon group at Gardiner’s Bay Country Club on Tuesday with pro Leigh Notley and his assistant Chance Scheffing kneeling in front. Jay Sessa, 14-time Gardiner’s Bay Club Champion, tees it up on Saturday in the United States Senior Amateur Championship at Kinloch Golf Club in Virginia. 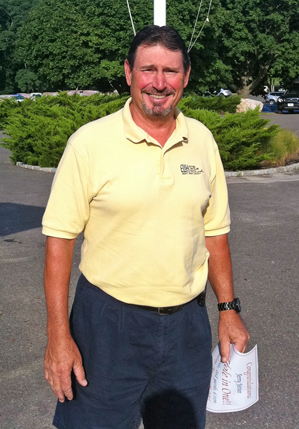 He was the leading qualifier last month at Elmwood Country Club in White Plains. Kinloch is a sensational golf course. It’s currently ranked 48th in Golf Digest’s top 100 courses in America and has been as lofty as 29th back in 2008. Jay, alongside 155 other great golfers, will play 18 holes each day over the weekend. After these 36 holes, the low 64 players will progress to the matchplay stages, a head-to-head knockout format ending with the final next Thursday. Good luck, Jay. All of us on Shelter Island will be routing you on. Play well! Stay tuned to The Golf Channel and its show Golf Central for updates throughout the event. Back at GBCC last week we didn’t hold any tournaments. The membership enjoyed general play all Labor Day weekend and the weather was sunny and breezy. Hello fall! Larry Adler took advantage of the beautiful conditions and from 186 yards, into a gale, on our 14th hole sailed his 5 iron 2nd shot into the cup for an unlikely eagle 2. The 14th is our hardest hole and, according to Bob DeStefano, our resident Oracle, he couldn’t remember anyone ever making 2 on the 14th before. Well done, Larry! The Ladies section already-postponed Closing Luncheon got more bad luck on Tuesday as the rain returned. Nevertheless, spirits were not dampened and despite no golf the ladies held a lovely luncheon and awards presentation. There was a lot of laughter and camaraderie as we recalled the events of the season. A total of 12 birdies were made in the 2011 season by: Nancy Ivers, Veronica Clements, Pat DiCerbo, Frances Gottfried, Nancy Barr, Barbara Mahoney, Christina Nemeth, Barbara Pollert, and Debbie Rouzee. Fran Gottfried won with 3 and Nancy Ivers was second with 2 birdies. We also awarded two Most Improved awards. The Ladies 18-holers award went to Betty Kapalla and the Patty Conway award went to young superstar and new club champion Samantha Sessa. Well played, ladies, and we look forward to everyone’s return next spring. Chilly Fillies next week! LEIGH NOTLEY PHOTO | The Senior/Junior Tournament players at Gardiner’s Bay Country Club earlier this month. The event had a great turnout, with many adults playing with kids from 7 to 17. 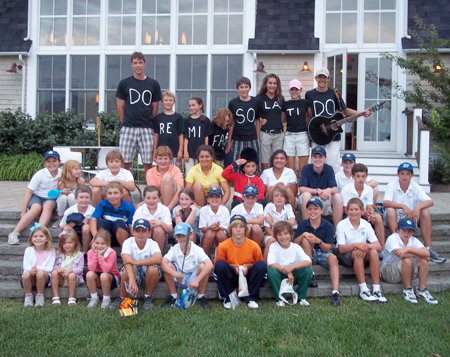 The Gardiner’s Bay Country Club juniors finally had to eat someone else’s dust last Wednesday, August 10, as they lost to Shinnecock by 10 strokes at Quogue Field Club. Quogue is a tricky but lovely nine-hole track on the water. This little links lured our juniors into an abundance of penalty strokes. Still it’s good to lose every now and again to stiffen one’s resolve. Maidstone Club this week! On Saturday, our club championship qualifying rounds took place in wonderful weather. In the men’s championship flight, with the reigning champ, Russell Holmes, taking the number-one seed and the morning off, Jay Sessa stepped in to steal the day’s honors with a sublime 68. The men’s A flight number-one seed was Bruce Dalton, who won last year’s C flight. Bruce has played beautifully in 2011. Twice he’s shot 81 in big tournaments this season and his handicap has been reduced 5.6 strokes, from 18.6 to 13.0, all at the age of 77. Mr. Dalton informed me the other day he has never broken 80. Unfortunately, a bunker rake halted this Saturday’s opportunity … long story, too little time. Suffice to say that Bruce probably went home and took a chain saw to his own garden rake in revenge. Bruce finished with 81 … again! Nevertheless, from C flight champ last year to A flight number-one seed this year is quite an achievement. Paul Ben-Susan won the B flight, qualifying with a great 82. Well played, Paul. John Quinn grabbed the C flight number-one seed with a 92 and Matt Vetri took the D flight honors with 95. 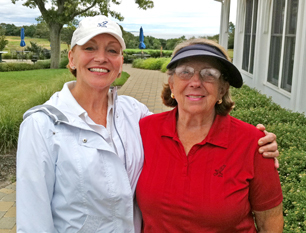 Nancy Barr (left) and Joan Gruber shot 65 to win the net scoring in the ladies Memorial Tournament on Tuesday. The following day, Sunday, the first-round matches were scheduled, and for the second Sunday in a row, it got soggy. It rained stair rods. However, some spirits weren’t dampened and six singles matches took to the old sod despite the heavy showers. I, for one, admired them. It was brutal out there and unfortunately there was no lightning to bring them off the course! It was like a scene out of “Caddy Shack.” There were even frogs in the hole cups! More matches will be played during this week and it should be an exciting weekend with the finals and some great golf. The ladies played their Memorial Tournament on Tuesday, a better ball from two tournament. Nancy Ivers and Dede Gray teamed up for an 89 gross to win and Nancy Barr and Joan Gruber shot 65 to win the net. Well played, ladies. One last note: Jay Sessa ventured off-Island last Wednesday to Elmwood Country Club in White Plains to play a United States Senior Amateur qualifying round. He shot 72 to qualify but, not only that, he lead the pack and won the medalist honors. That’s a great achievement Jay. Good luck at Kinloch Golf Club in Virginia in September. Gardiner’s Bay will be cheering you on! 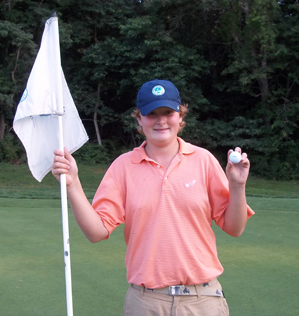 LEIGH NOTLEY PHOTOS | Twelve-year-old Cole Colby sunk a hole-in-one on the 4th tee at Gardiner’s Bay Country Club last week. The cup runneth over with excitement and golf balls at Gardiner’s Bay Country Club this week. It all began last Wednesday during the Senior/Junior Tournament. Twelve-year-old Cole Colby stood transfixed on our fourth tee — you know it, the hole with the pond — his piercing stare intently monitoring his golf ball’s flight. It soared from his crisply struck five iron and sailed through the stratosphere on a bee-line for the stick: the flag-stick, that is! One bounce, two bounces and into the cup it went! It was his first hole-in-one. May it be the start of many. Cole, congratulations! The Senior/Junior Tournament had a great turnout this year with many adults playing with kids whose ages ranged from seven to 17. This year, first place went to Jay Card, Halsey Quinn, Matt Feinstein and Eric Ivers with a step-aside scramble 32. Taking second place, with a 34 and a match of cards, was John Colby, Sam Sessa, Brian Feinstein and Jack Ryan. Woody Fischer, Myles Clark, Shea Dailey and Marnie Colby took third. Thank you to everyone, members and guests, who came out to play in the Senior/Junior Tournament. We look forward to seeing you all play in the tournament again next year. The following day we hosted the East End Junior Inter-Club matches. Our juniors have been blitzing the fields every week and this week was no exception as Brendan Shea (38), Sean Quinn (42) and Myles Clark (44) led the team with solid performances and another team win. Now we’re 4 for 6! A few days later, Jerry Jetter shot a hole-in-one on the 9th. The Gardiner’s Bay Ryder Cup matches, our most eagerly awaited mixed-member tournament, had the misfortune of being held on Sunday morning. After a very dry July, all the rain on the plain in Spain appeared on Shelter Island on Sunday morning. The greens became waterlogged but the intrepid competitors made it through a stop-and-start nine holes. The results to be taken forward to August 27 are: 11964, 5 points; 11965, 3 points. Thank you to the teammembers who gallantly and valiantly fought to the soggy death. Preparing for the Club Championships, the Ladies 18 holers played match play on Tuesday and will practice this weekend and next. They are divided into two teams. Fourteen ladies representing the blue team battled against the other 14 from the white team. Christina Nemeth shot 85 gross, a fantastic performance, and Fran Gottfried made 2 twos, which is rare. The blue team edged out the white team 7.5-6.5. Well played, ladies. Last Tuesday, Chance Scheffing (my assistant) and I sprinted over to Shelter Island Country Club to join the group scramble that ventures out onto the fairways in the late afternoon. We wanted to break the record! The bar had been set a month ago when the group had shot 25 with a couple of pros from The Bridge. That was all Chance and I needed to know. On the ninth green, with the sun setting, Lyndy Edwards holed a 25-footer for our group to shoot 23. Personally I believe this might stand for a while. Thank you to the group and to Shelter Island Country Club for being wonderful hosts. Finally and unbelievably, we had a second hole-in-one to bookend the week. Jerry Jetter, playing the first eight holes solo, had Ben Jones join him on the 9th tee. Jerry promptly struck into the cup with a 6 iron. Our ambulance man Ben nearly had to resuscitate Mr. Jetter on the tee box. Well done, Jerry!